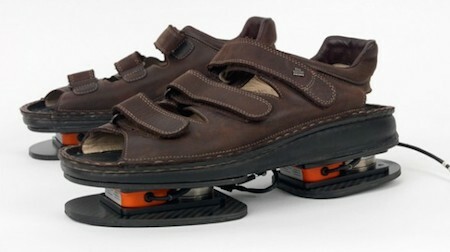 ForceShoes are NASA's new sandals for exercising astronauts on the International Space Station. The sandals are intended to measure load data as the astronaut does necessary workouts to make sure that essential muscle activity is accomplished. NASA chose the ForceShoe design because it offers comprehensive data about workouts. Astronauts could have just taken readings from force meters installed on the ARED machines, but having them attached to one’s feet allows for the collection of data along all three axes and can even track how weight is distributed. Before the ForceShoes become part of the daily routine for NASA astronauts, they will be validated in a series of tests on the ISS. "When we got back," Joe told Brown, "we were practically invalids. No exercise up here. This time we've brought some harness to wear. We've some for you, too..."
Joe got out the gravity-simulator harnesses. He showed Brent how they worked. Brown hadn't official instructions to order their use, but Joe put one on himself, set for full Earth-gravity simulation.